Clothed in spotless white the image of simplicity and gentleness, Anandamayi Ma was one of the most influential spiritual teachers of our time. He devotees ranged from prime ministers to renowned saints to humble villagers. Although virtually uneducated, Ma spoke with the authority of direct experience and mesmerized all with her ethereal beauty, sweetness and grace. A free spirit, she wandered all over the country showering her love and tender care on everyone. Across India, several ashrams, established and dedicated in her name, today serve as sanctuaries for spiritual seekers. Wherever she went, miracles followed in her wake. From suddenly appearing at the beside of a dying woman to breathing life into an ant crushed thoughtlessly underfoot, everything was manifested effortlessly and graciously through Ma. Her Samadhi at Kankhal near Haridwar, radiates peace and showers blessings on devotees who came to pay their respects from all over the world. 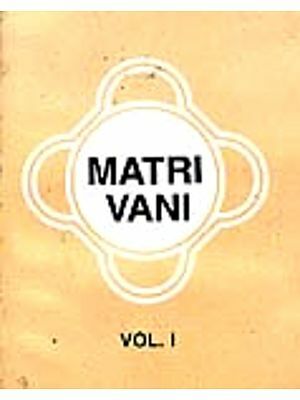 This short biography, written by a dikshit, - a direct disciple of Ma, seeks to acquaint you with the sacred persona, inspired wisdom and the divine life of Anandamayi Ma. Its highlight is a chapter on new incidents that have come to light and never before been published in any biography of Ma. 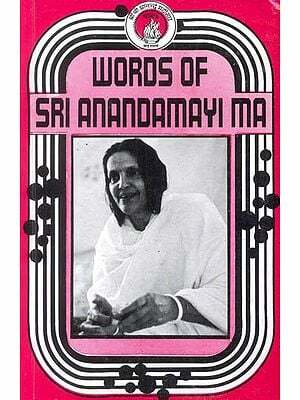 Who is Anandamayi Ma, and how do we write about her? Ma is the Mother of All. For six consecutive years (1976-1982), I lived and moved in Ma,s Presence. During this entire period, there was not a single moment when I perceived Ma as a simple human being, but always beheld her as a living, human manifestation of complete and perfect divinity. An American disciple of Ma, Swami Mangalananda has lived in our ashram in India for many years. He has performed an invaluable service in writing this brief and readable account of the events of Ma,s life. By reading the pages of this book, you will not be reading the life of a historical character alien to yourself, but you will have literally begun the discovery of your own deeper self. When you finish this book, you will undoubtedly feel an unknown urge arising from the innermost recesses of your heart to be one with Ma. This will lead you to your real destiny and be a lamp shining on your path to the fulfillment of the very purpose of the evolutionary process. At its conclusion, it will be seen that the path, the struggle, and the goal are all none other than Ma herself, the Divine Supreme. 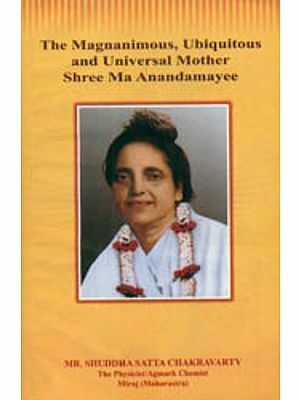 There are many authoritative and well-written books about the life and teachings of Anandamayi Ma. 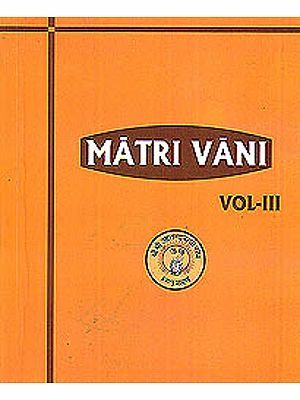 But, all the existing books are rather voluminous and are available only from a limited number of sources. What was lacking was a brief biography that included the high points of Ma,s life, with a few suitable pictures. 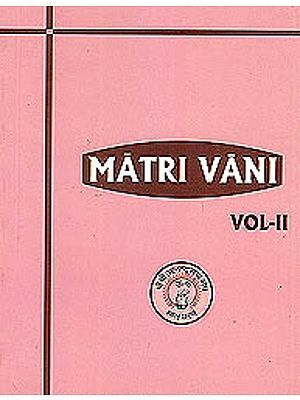 Such a book could be priced fairly, distributed widely, read quickly, and would, hopefully, serve to acquaint people with the divine life of Anandamayi Ma. If anyone wanted to know more, there was always the standard literature one could acquire. It is hoped that this short biography, written specifically at the request of the devotees of our ashram, will fulfill his need. To some extent, almost all biographies reflect the subjective views of the author, and this book is certainly no exception. It is not meant to be a reference book, but an informal introduction to a divine and inspiring life that should never be forgotten. 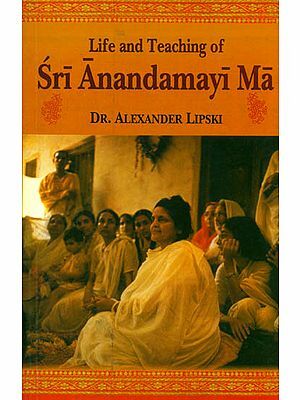 Although the life of Anandamayi Ma is filled with supernatural and miraculous events, it is not the life of a legendary figure of some bygone era, embellished with fanciful folk tales handed down from generation to generation. Many people living today, including the author, witnessed the events recounted in the books written on her life. Most of these are drawn from the personal accounts of friends, relatives and other witnesses who experienced these incidents and occurrences for themselves. May all who had the grace of meeting Ma, continue doing everything possible to keep her memory alive and teachings relevant for succeeding generations, so that this unique entity who came among us, may continue to influence and uplift the human race. 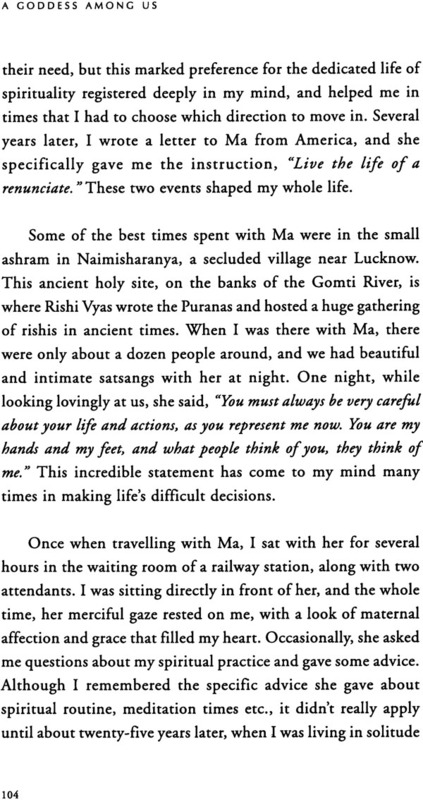 Anandamayi Ma was often asked the pertinent question, are you?” She would reply to this question, at different in different ways. She once told a very close disciple, I am the vyakta rupa of the pure aspiration of all true spiritual aspirants. You called for this body, and now you have it among you” By this definition, we see that Ma belongs to all who I an inner yearning for the Divine, and she came for all of us. 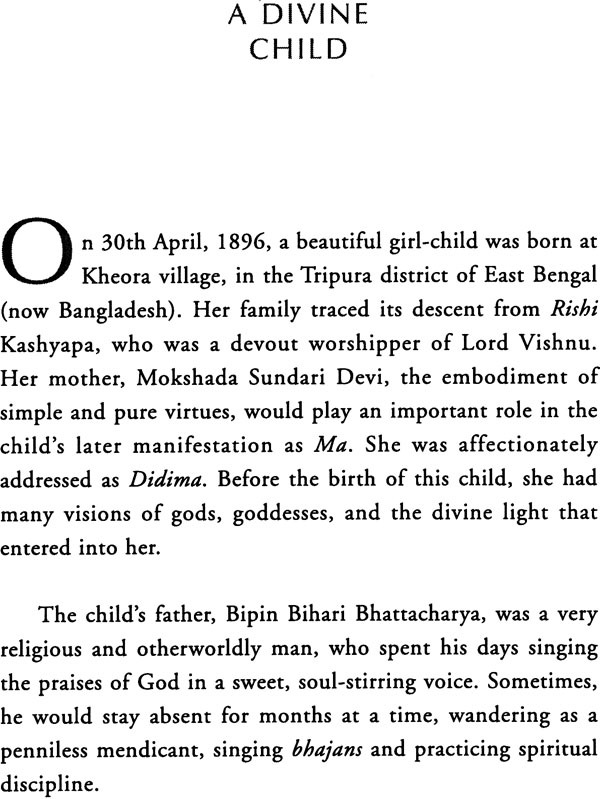 To know and study her life is of great importance and significance. 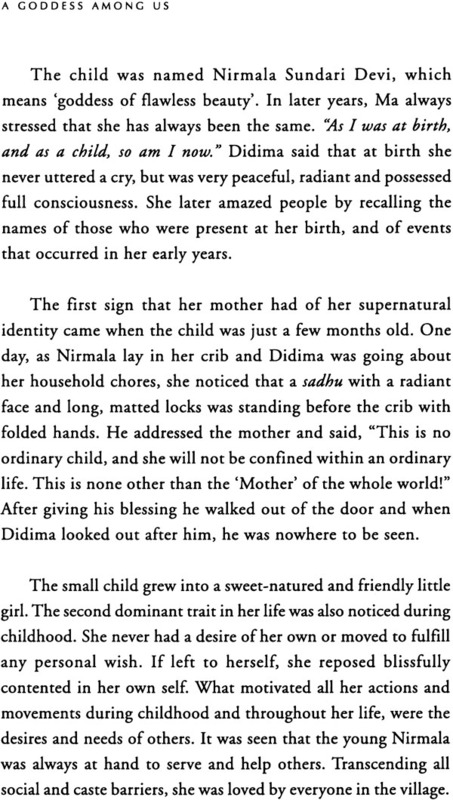 Many times, Ma stressed that the manifestation of her birth was not a result of karma, as is the case of a soul trapped in relativity. We are bound by our karma and by the destiny we have to fulfill. 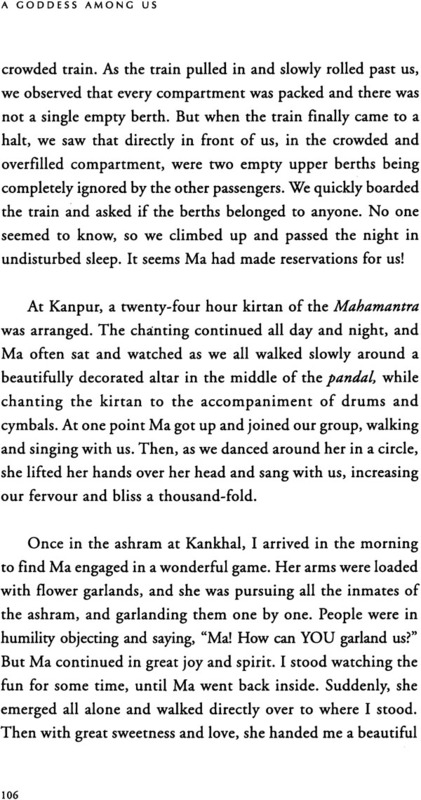 Ma was a completely ‘free, being, and her every action and word was an expression of this freedom and divinity. 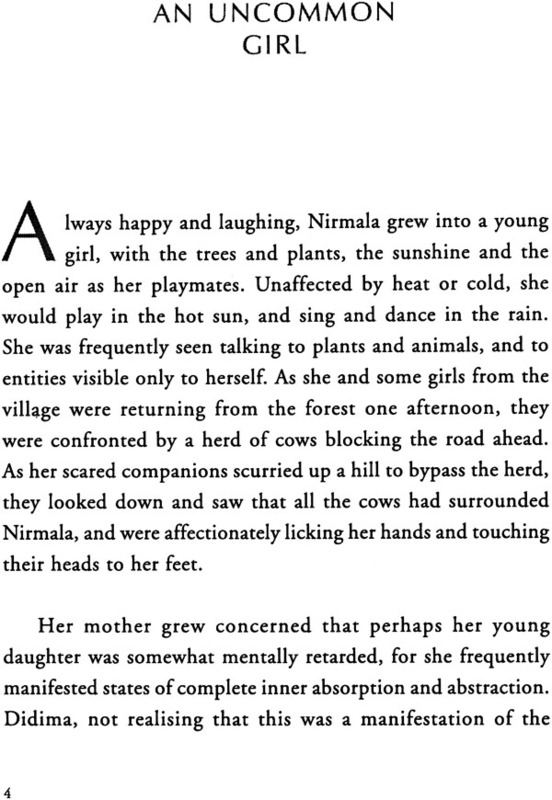 Therefore, every minute detail of her life bears a moral lesson. Those who saw her felt that every movement of her body was a divine expression of sublime beauty and grace. Ma frequently said that everything she did was for all of us. The lila that she performed on the world stage was for all those who had joined their minds and hearts to hers. She became a repository of all spiritual blessings and powers, and still is, to those who know of her and think of her. Ma also said that no one could think of her unless she first thinks of them. Therefore, in the knowing of her life, and in thinking of her divine lila, we tune in to all her virtues and perfection for the blessing and upliftment of our own hearts and lives. The more we know about her life and teachings, the more that eternal life lives in us, and her words can constantly guide our actions in the difficult times we live in.